While working on a kitchen renovation Apartment Therapy's Annie Werble uncovered a structural column smack dab in the middle of their design. 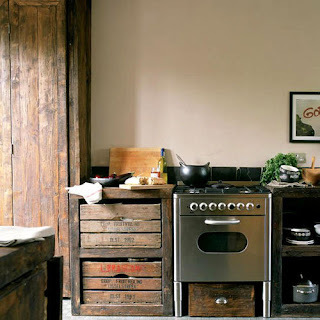 To incorporate the discovery into the scheme, they set vintage railroad ties on all sides of the concrete structure, and the gorgeous patina of the wood makes the eyesore melt away. Check out the rest from those resourceful folks over at: Apartment Therapy. And if you happen to be looking for reclaimed wood in your area the Building Materials Reuse Association is a great place to start.